Turbo dreams of speed. He believes in the words his idol preaches from the winner's circle, "No dream is too big and no dreamer too small." Confident, almost to a fault, he believes he one day will be fast enough to... Well, I'm not exactly sure what he thinks he'll be fast enough to do, but you better believe he knows one day he'll be fast and given the nature of the story it just so happens he'll one day find himself in the starting blocks at the Indianapolis 500. Where the film truly excels is in the group of racing snails Turbo finds himself in league with beginning with Whiplash, the fast-talking leader of the group voiced by Samuel L. Jackson whose consistent one-liners provide the majority of the film's comedic beats. The rest of the gang includes Smoove Move (voiced by Snoop Dogg), Burn (voiced by Maya Rudolph), Skidmark (voiced by Ben Schwartz) and White Shadow (voiced by Mike Bell). Each has their "thing" with Burn's attraction to Chet and her goal to call him her "Boo" as one of the cuter punch lines, but that's just it... Turbo is cute, little more. 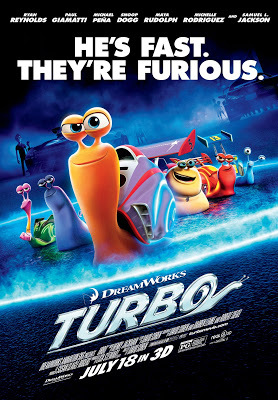 With some unexpected musical cues such as an "Eye of the Tiger" remix featuring 2Pac, Ken Jeong voicing a woman, crows getting their comeuppance and a couple of goofy little gags such as the snails using their eyes as hands, there isn't much to really complain about when it comes to Turbo. It's a film that works. Kids will be satisfied and parents should enjoy their time in the theater well enough. Just don't expect an animated film for the ages, because you're not going to get it.